Hubby and I drink a lot of coffee but during the hot summer months we really go after the iced coffee version. After all, we need to keep cool and we need to have our daily coffee fix! Recently we were sent 4 of the RealBeanz Iced Coffee Beverages to try out for all of you. You can drink them straight from the bottle or mix them up with some other ingredients (including alcohol) to come up with some tasty drinks! 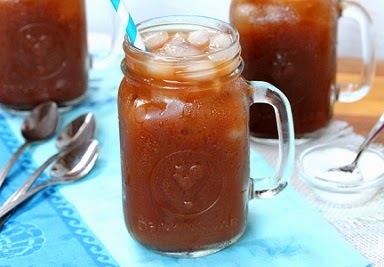 We decided to whip up the RealBeanz Mandarin Cafe Iced Coffee Cocktail Recipe and wow...they were delicious! They are really easy-to-prepare and make a nice drink for just relaxing or for when you are entertaining some friends. In a shaker, combine ice, RealBeanz, orange liqour and rum. Shake and pour into glass. Squeeze two tangerine slices into the drink and place one slice on rim of the glass for garnish. In a shaker, combine RealBeanz Caramel, vanilla vodka and ½ tspn of ground cinnamon. Shake vigorously and pour into mason jar. Sprinkle with cinnamon for garnish. We enjoyed all 4 of the delicious flavors that we were sent for the review. My personal favorite was the RealBeanz Iced Coffee Cappuccino and Hubby's favorite was the Iced Coffee Vanilla Nut. With that said...they were all delicious and we would buy every single one of them! You can head on over to the company's site to learn more about RealBeanz and to view all of their yummy recipes. Disclaimer: Shelly Hill has personally reviewed the product listed above. Shelly has not received any monetary compensation for her review. Shelly did receive a free product to try out so she could evaluate and use it for her review. Her thoughts & opinions in this review are unbiased & honest and your opinions may differ. The Shakin N Bakin Blog is not responsible for delivery/shipping of giveaway items won from this blog nor are we responsible for mis-use or injury caused by items won from this Blog. Content on this blog is copyrighted, all rights reserved. We reserve the right to legally pursue anyone who violates our rights and/or steals our copyrighted material.